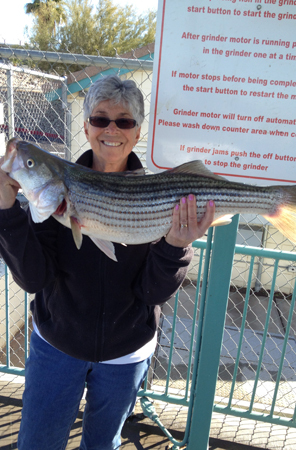 A valid Arizona fishing license is required for anglers 10 years of age or older. Licenses will be valid for one year from purchase date. Licenses available at: Bass Tackle Masters, K-Mart, Wal-Mart, and West Marine. Starting in 2014, the Colorado River Stamp — California will no longer be available. The privileges of this stamp are now bundled together and included in the Arizona General Fishing license and Combo Hunt/Fish (youth, adult and short-term) licenses. These licensees may fish from a boat on any waters that form the mutual boundaries between Arizona and California; or when fishing from the California shorelines of these waters. in addition to large stretches of the Colorado River, these fishing privileges include Lake Havasu and associated backwaters (e.g., Martinez Lake, Mittry Lake). Snagging for carp and shad is allowed from Jan. 1 through March 31, and from Oct. 1 through Dec. 31. Live bait may be taken by minnow trap, dip net, cast net, pole and line, handline, crayfish net or seine. Cast nets shall not exceed a 4-foot radius (or an 8-foot diameter). Landing nets or dip nets may be used forthe capture of legal baitfish or crayfish or only to land a legally hooked fish. Any unattended traps or devices used to catch or hold aquatic wildlife or fish must have attached water resistant identification legibly bearing the name, address, and fishing license number of the person using the device. All aquatic wildlife taken incidentally while capturing live bait with nets or traps must be returned immediately and unharmed to the water after being caught. All legal baitfish and crayfish caught must be for personal use only and are not to be sold or used for commercial purposes. All new fishing and combo licenses allow the angler to fish with two poles or lines simultaneously. In no case are more than two lines allowed to be used at the same time. “Angling” means the taking of fish by one line and not to exceed two hooks, by one line and one artificial lure, which may have attached more than one hook, or by one line and not to exceed two artificial flies or lures. Fishing lines must be constantly attended and in immediate control. The hook, fly or lure must be used in such a manner that the fish voluntarily attempts to take it in its mouth.